A dance producer(?) in Wanchai. I guess ‘Bacchanalia Dance’ was already taken. 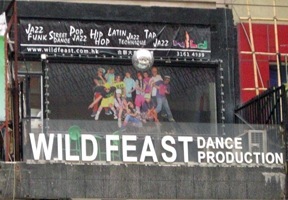 Apparently they manufacture a myriad of wild dance feasts, from tap to hip hop, even ‘jazz funk’. 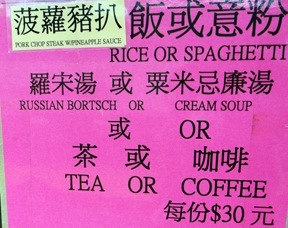 Unsure of what kind of food to serve at your upcoming jazz technique wild feast? Well, these are the people to ask. I wonder if they do blood sacrifices as well, say during the average wild tap feast. Do they tap dance on the goats with razor tipped metal taps? Maybe they make the goats tap dance, after plying them with wine and... well whatever goats prefer to feast on. Exquisite kitchen scraps? 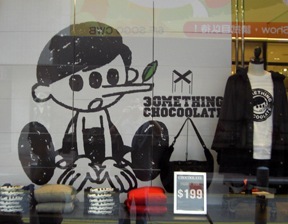 A window display for Chocoolate, a hipster brand here in HK. They usually have pretty eclectic advertising, and I’ll admit it got my attention, but in a what the hell is that supposed to mean? sense. 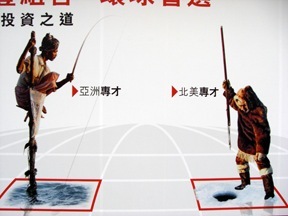 The three eyes on Pinocchio are a bit disconcerting–and why use Pinocchio in the first place? Also the leaf growing from his nose doesn’t help clear up matters. Does that mean he’s lying, but in an environmentally responsible way? 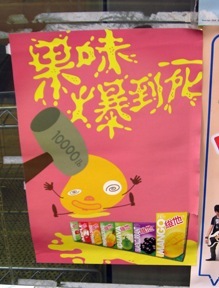 A poster in Kennedy Town for a popular local juice company. Seems they get their distinctive smooth mango juice by employing a 10,000 lb. hammer to crush anthropomorphic mangoes into a fine paste prior to juicing. That explains the distinct tang of fear and panic that permeates all their products. I love the swirly ‘I just got hit by a 10,000 lb hammer and its a bit disorientating’ eyes, and the puddle of fear induced urine (juice?). I just wonder though–does the mango know the hammer’s coming, or do they surprise it and get even more fear pheromones in the bargain? A bit of a throwaway posting, but I’m on vacation. 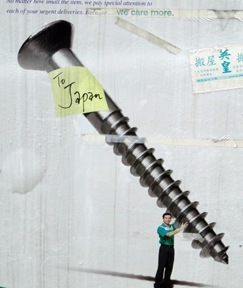 A HK post office poster for sending things abroad, based on the tried and true ‘look a crazily oversized object!’ motif. I don’t know if this was an intentional inside joke or not, but there are still many who’d love to screw Japan over but good. Honestly though has anyone ever sent screws via the post office? My uncle needs some #24 philips head galvanized pronto - I better get down to the post office right away!